Pristine and transparent low frequency response for your studio! The KRK 12s Powered Studio Subwoofer is the perfect complement to KRK VXT series, KRK Rokit series, or any other 6-10 inch studio monitor. The KRK 12s sub extends the response of an existing monitor system so that the low-frequency portion of the mix can be engineered. 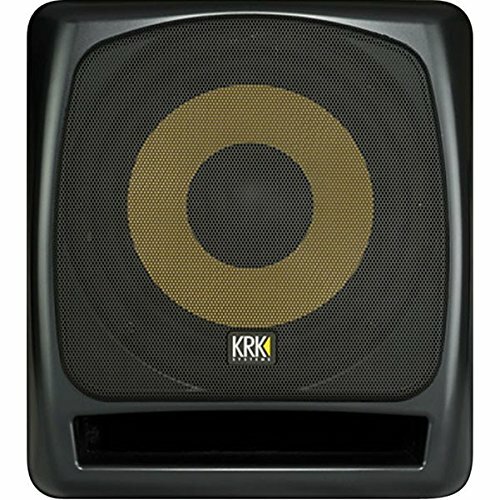 The KRK 12s features the powerful accurate and low distortion sound that is the hallmark of all KRK monitors. An efficient and low distortion 225-watt amplifier makes the KRK 12s sub perfect for project and professional studio applications that require increased signal pressure. The front-firing bass port and KRK's light weight and high strength Kevlar woofer ensure a dynamic low-end punch. The KRK 12s powered subwoofer has extensive bass management utilizing a full phase adjust and reverse, LFE input capability, Internal and defeatable Limiter, and both balanced and unbalanced inputs. The KRK 12s subwoofer also has an internal crossover which can be switched in and out of the path when muting the sub which allows full range material to be compared with and without subsonic content. A sturdy grill protects the driver cone and adds to the sleek appearance of the unit. Every studio benefits from the use of a sub to monitor low frequency content. With the prevalent use of home theater systems, as well as commercial systems in clubs and cinemas - production studios require the capability to identify and correct problems such as unwanted low frequency components, exterior noise, microphone rumble and vibrations. The increase of home and project mastering means many potentially great pieces of music are being poorly represented when played back on a larger system. When dealing with subsonic frequencies if they cannot be heard accurately they cannot be mixed accurately. The KRK 12s sub gives you that ability!